I originally intended on posting this during Blogmas, as this is a lovely treat to have with coffee or tea. However, because I was so busy during the last week or two, I rarely had the time to sit down and write the post, despite the fact that pictures had already been taken. I didn't even have the time to wash my dishes for days, until after Boxing Day, so imagine coming home from the Christmas festivities to a huge pile of dishes. Yeah, not fun, but I digress. This recipe is too good to pass up, so I'm sharing it with you all today. 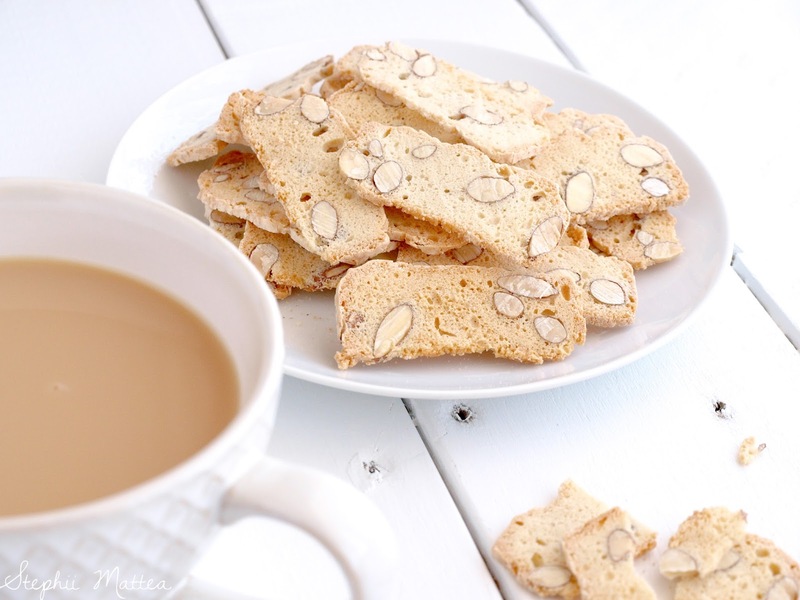 Almond biscotti, or almond bread, is basically a meringue folded with flour and almonds, baked in a tin and then sliced thinly to be baked again until crisp. 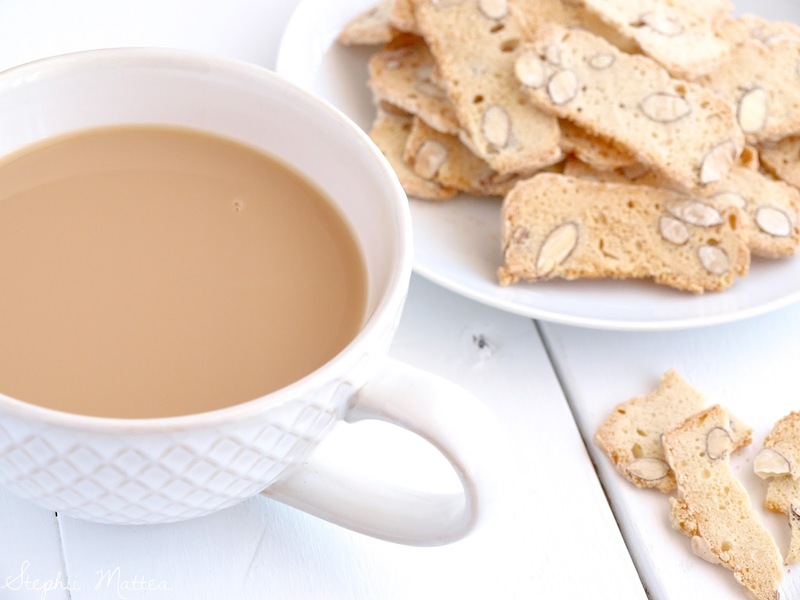 The problem with almond biscotti is that they're ridiculously addictive, so you simply cannot stop at just one. I've devoured a whole plate of these once because they are one of my favourite sweets. 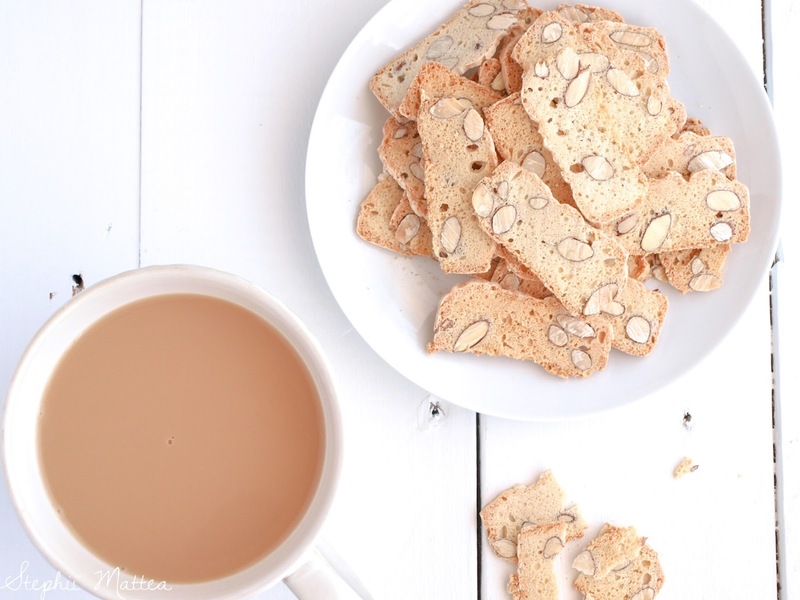 Almond biscotti have the benefit of not being tooth-achingly sweet and being thin, crispy and light, which make it a perfect treat in my books. When I went to see Nonna sometime before Christmas, I asked her about her biscotti recipe, because I wanted to have a collection of her recipes. She asked me if I meant 'mandorla biscotti?' and I said yes. And she was like "do you know what 'mandorla' means?" She took out her book of recipes, a little thing that was falling apart at the spine, and propped it open to the recipe I was looking for. She explained that she actually got this recipe from my other grandmother, and then went on to ask if I would even be able to read it since it was in Italian. I tried my best to translate it, but I got a few terms wrong. Luckily, you guys won't have to deal with that, as I took the liberty of using Mum and Google Translate to figure out the rest of the recipe. The measurements for this recipe is in the metric system, so you'll need to bear that in mind if you're used to the Imperial system. Another note; you can use a mixture of nuts in this recipe, even dried fruits if that is your fancy. Enjoy! 1 teaspoon of vanilla essence or extract or the seeds from one whole vanilla bean. 1. Preheat the oven to 180ºC and grease and line a loaf tin with baking paper. Ensure the mixing bowl is clean, and use a paper towel dipped in vinegar to give it a wipe down to get rid of any possible fat particles. 2. Beat the egg whites with the whisk attachment to your electric mixer, or a handheld beater, until it becomes foamy and stiff peaks foam. You'll know it's ready when you hold the bowl upside down and the egg whites won't budge. Add the sugar one tablespoon at a time until all of it has dissolved and the meringue is glossy and stiff. 3. 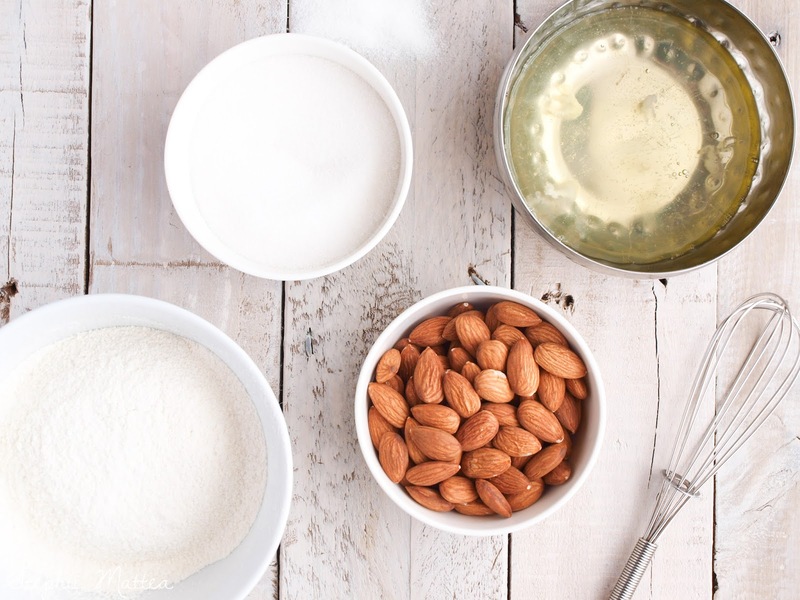 Add the vanilla essence and half of both the plain flour and almonds, and fold through with a spatula until just combined before adding the rest of the dry ingredients. Combined until you can no longer see the flour, and then spoon into the prepared tin. 4. Bake in the oven for 30 to 40 minutes or until pale golden brown, and leave to cool in the tin before removing. 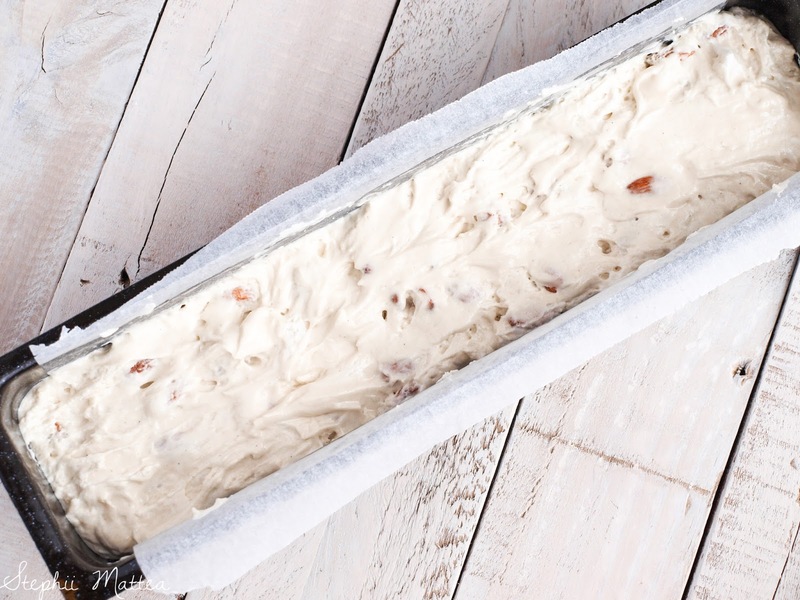 Wrap the loaf in cling wrap and refrigerate for 30 minutes or overnight. This is to make it easier to slice. 5. Use a serrated knife if you're cutting the loaf by hand, and it has been refrigerated for some time. You want to slice it about 2mm thin. I prefer to use a deli slicer for this to greatly reduce the time spent on the recipe, and the thickness is consistent. 6. Arrange the slices in a single layer on trays and bake in a slow oven, about 150ºC, for about 45 minutes. Keep an eye on them to make sure they don't darken in colour, because you want them to remain white in the middle with a brown edge or crust. As you can see, it is a very simple recipe and it doesn't take much time to prepare. In fact, the most lengthy process is to cut the biscotti into very thin slices by hand. Well, that is, if you're not sitting next to the oven waiting for the damn things to be cooked because, be prepared, it'll take a while. I look forward to hearing what you guys think about this recipe but don't come crying to me when you mysteriously gain a kilo. I told you they were addictive. I've thankfully eaten all of the biscotti in this house and my mum's house, so there's no more temptation while I try to lose the extra weight I gained over the holidays. The biscotti are to blame, I promise you that. And the mince pies. Oh, and the ice cream because it was so bloody hot! I hate summer. I'm not looking forward to tomorrow because it will be 38ºC/100ºF, and I have to leave the house first thing for a doctor's appointment. Add in about three hours of public transport, and you'll have a pissed off Stephii Mattea. Follow me on Twitter because I think I might do a play by play of my day as I sweat and swear my arse off. Do you have any recipes passed down to you from your grandparents?